I'm behind on my reviews, but will be back next week with Kate Breslin's Not by Sight. Until then, I'm doing my July Bookshelf Giveaway. "Like" or "comment" here or on my Facebook post and you're entered to win your choice of one of these books--all of which I reviewed last month. Thank you for the giveaway. I would choose the Denise Hunter book if I won. I just bought Beth's book this week. I'd love to have my name in the drawing for Denise's book. I always enjoy your reviews! Thanks for sharing! 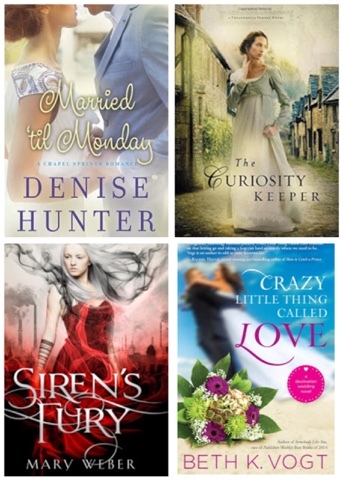 The Curiosity Keeper and Married 'Til Monday are both on my To-read bookshelf! I love Denise and Sarah! My daughter and I BOTH loooooved them! I would LOVE to read THE CURIOSITY KEEPER. Your reviews are the best and sure do make me want to read the ones you've featured. I would love to have a chance to read The Curiosity Keeper. Thank you for this giveaway opportunity ! You're so welcome, and I've got you entered!